Having a customized giveaway can help to boost your sales and increase your bottom line. 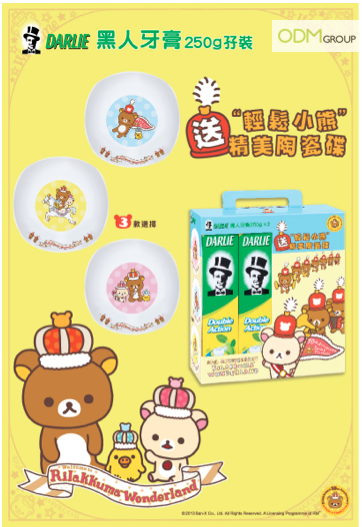 Darlie toothpaste is using this marketing tactic this time, and giving away customized Rilakkuma bowls with purchase of their toothpaste! Read on more to find out how you can follow this market trend and have your very own customized giveaway too! RilakKuma is a popular cartoon brand in Japan and has gained its popularity in the south Asian region. Started in 2003, collectors around the world have sprung up and been purchasing anything related to this cartoon character. · Do you have the same target group? · Does the customized giveaway create impulsive buying behavior in your customers? · Does this partnership in marketing gift create a win-win situation for both of you? · Is this customized giveaway attractive? Will it help you to increase sales? Although there are many things to consider, a customized giveaway is always better than a regular one. It can be a platform for direct advertisement to your end clients. Darlie has successfully ride on the waves of RilakKuma’s fame and as a result, sales increased because of the customized bowls. Choosing the right partner can be extremely ideal and essential step in your marketing giveaway. · Customized beauty case with Marie Claire and Agnès b. Contact ODM today to produce your special customized giveaway!